The Vascular Access journal is directed to professional clinicians who are dedicated to enhancing the practice of vascular access and infusion therapy. It is published three times each year, in both print and electronic formats. Vascular Access features original, peer-reviewed articles on current vascular access and infusion therapy issues related to practice, education, research and leadership that will assist in growing and developing the specialty. Printed copies of Vascular Access are distributed to approximately 1,000 CVAA members and subscribers throughout Canada and internationally. CVAA members are involved in every aspect of vascular access and infusion therapy from clinical care and education to research and administration. The publication’s target audience includes nurses, physicans, pharmacists, radiology technologists/technicians and respiratory therapists who provide vascular access and infusion therapy, as well as administrators and clinical leaders who are responsible for education. Vascular Access provides a direct link to the community of specialists who practise vascular access and infusion therapy across Canada and beyond. The journal is an important marketing tool for corporate branding, new product introduction and ongoing promotion, services and more. Ads in Vascular Access have added value, with the electronic version linked to advertisers’ websites. With a commitment to all three journal issues, advertisers automatically receive a complimentary logo ad in all three issues of the CVAA e-newsletter, CVAA Link, with a link to advertisers’ websites included. With bleed: 8.75" × 11.25"
Type margin: 6.75" × 9.5"
Electronic files only. Colour proof to accompany files. Ads should be in PDF. Provide all fonts and support files (e.g., scans). Ads should be supplied to correct size; include additional .125" bleed on full page ads. Email or FTP transfer. FTP instructions available upon request. Ad production/design, if required, is available and is billed in addition to advertising rates. 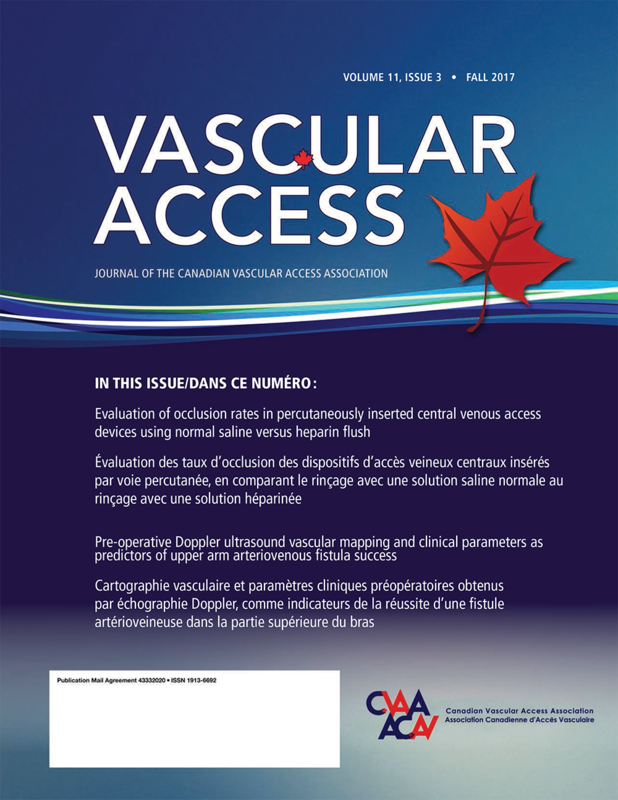 Vascular Access is published for CVAA by Pappin Communications, Pembroke, Ontario.